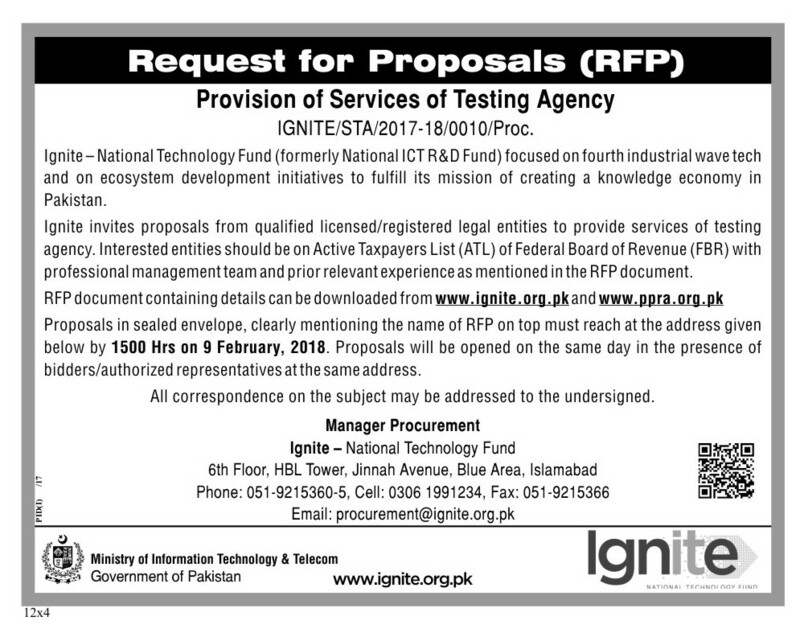 Ignite invites proposals from qualified licensed/registered legal entities to provide services of testing agency. Interested entities should be on Active Taxpayers List (ATL) of Federal Board of Revenue (FBR) with professional management team and prior relevant experience as mentioned in the RFP document. Proposals in sealed envelope, clearly mentioning the name of RFP on top must reach at the address given below by 1500 hrs on 9 February, 2018. Proposals will be opened on the same day in the presence of bidders/authorized representatives at the same address. All correspondence on the subject may be addressed to the undersigned. Submission Deadline: Deadline for proposal submission is Friday, February 09, 2018. Ignite formerly National ICT R&D Fund, under the auspices of the Ministry of Information Technology & Telecom, earlier invited proposals to execute a Digital Skills Training Program for youth and those eager to learn marketable skills in freelancing and entrepreneurship using the Internet. Several proposals have been received and are being evaluated. 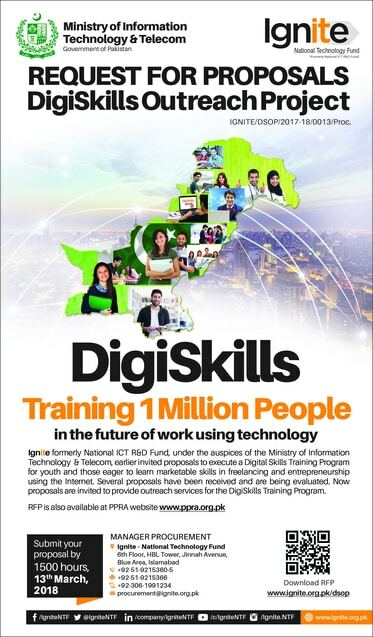 Now proposals are invited to provide monitoring and evaluation services for the DigiSkills Training Program. Ignite formerly National ICT R&D Fund, under the auspices of the Ministry of Information Technology & Telecom, earlier invited proposals to execute a Digital Skills Training Program for youth and those eager to learn marketable skills in freelancing and entrepreneurship using the Internet. Several proposals have been received and are being evaluated. 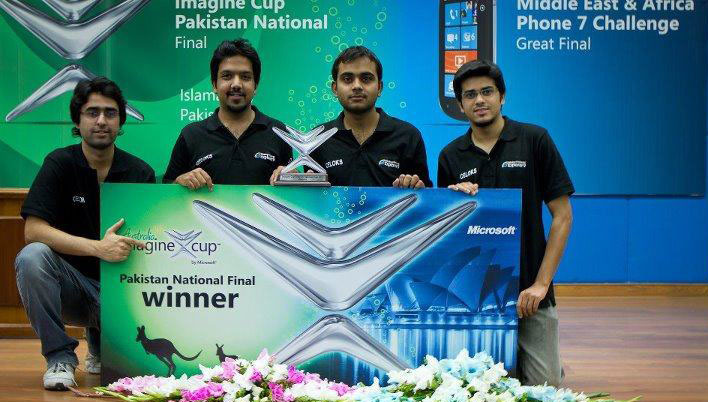 Now proposals are invited to provide outreach services for the DigiSkills Training Program. 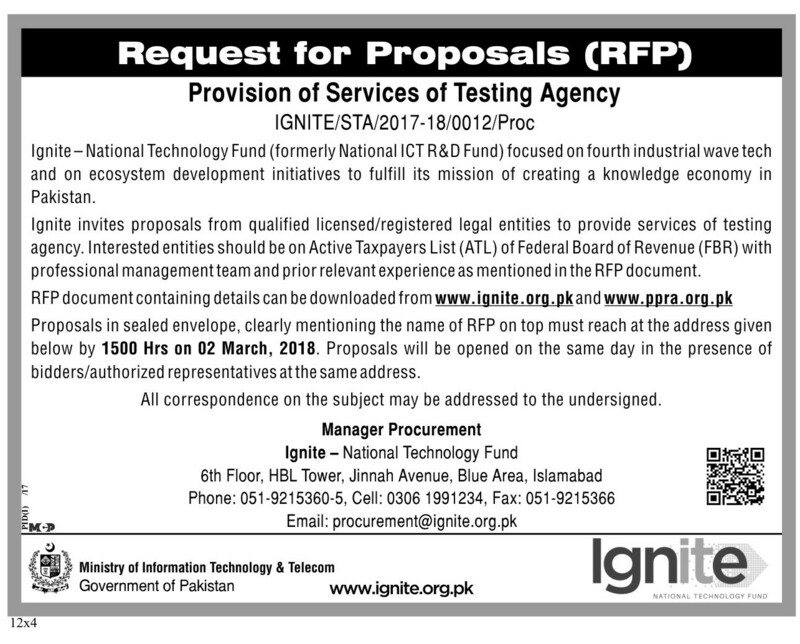 Ignite formerly National ICT R&D Fund, under the auspices of the Ministry of Information Technology & Telecom, earlier invited proposals to execute a Digital Skills Training Program for youth and those eager to learn marketable skills in freelancing and entrepreneurship using the Internet. 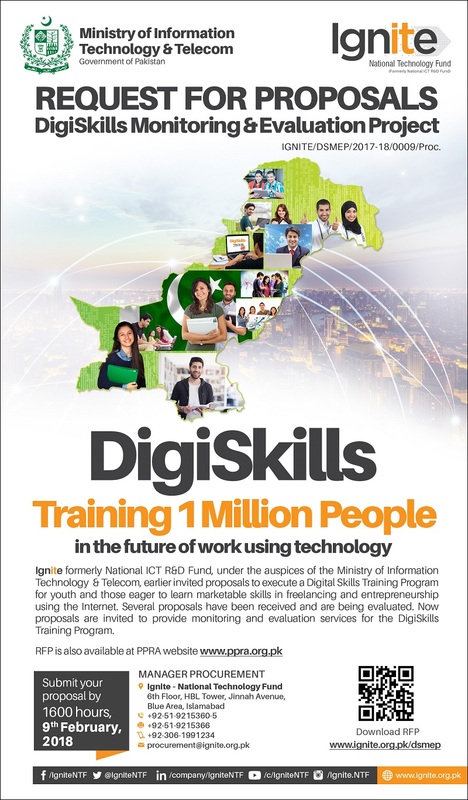 Proposals are invited to provide outreach services for the DigiSkills Training Program. Deadline for proposal submission is Tuesday, March 13, 2018. 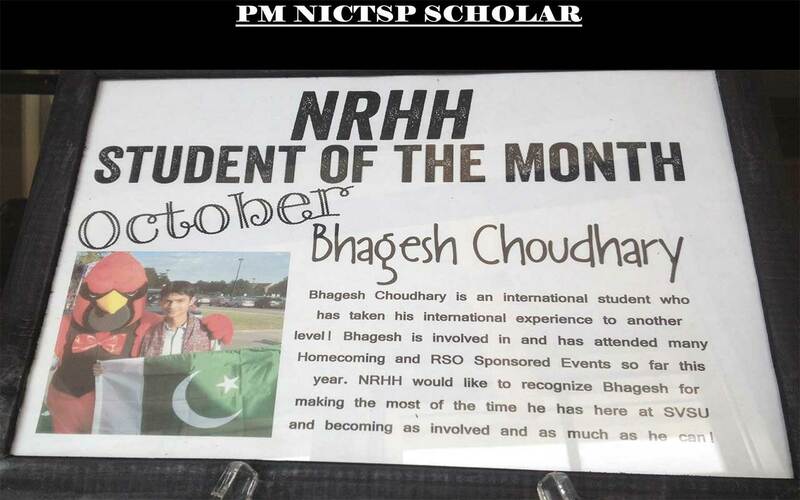 Address: Manager Procurement Ignite – National Technology Fund 6th Floor, HBL Tower, Jinnah Avenue, Blue Area, Islamabad Phone: 051-9215360-5, Cell: 0306 1991234, Fax: 051-9215366. Proposals in sealed envelope, clearly mentioning the name of RFP on top must reach at the address given below by 1500 hrs on 02 March, 2018. Proposals will be opened on the same day in the presence of bidders/authorized representatives at the same address. Deadline for proposal submission is Friday, March 02, 2018. 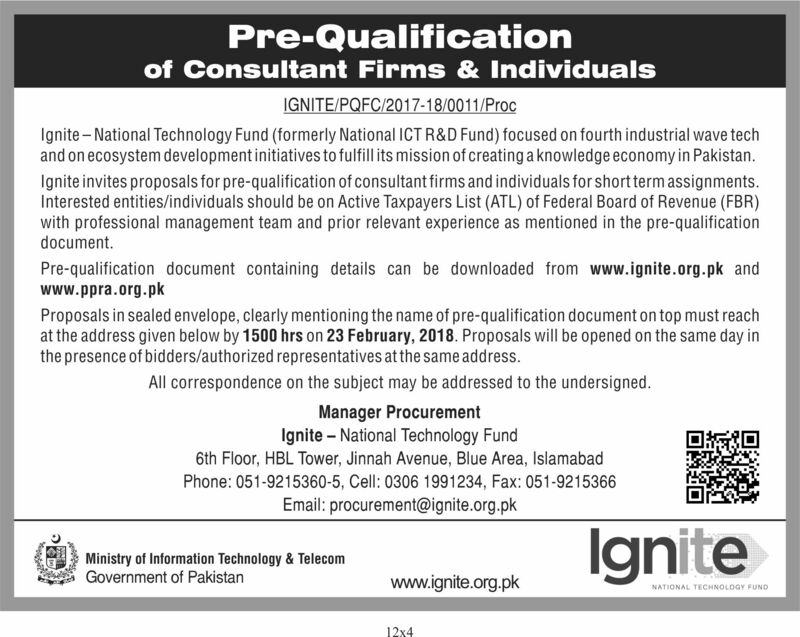 Ignite invites proposals for pre-qualification of consultant firms & individuals for short term assignments. Interested entities/individuals should be on Active Taxpayers List (ATL) of Federal Board of Revenue (FBR) with professional management team and prior relevant experience as mentioned in the pre-qualification document. Proposals in sealed envelope, clearly mentioning the name of pre-qualification document on top must reach at the address given below by 1500 hrs on 23 February, 2018. Proposals will be opened on the same day in the presence of bidders/authorized representatives at the same address. Deadline for proposal submission is Friday, February 23, 2018. 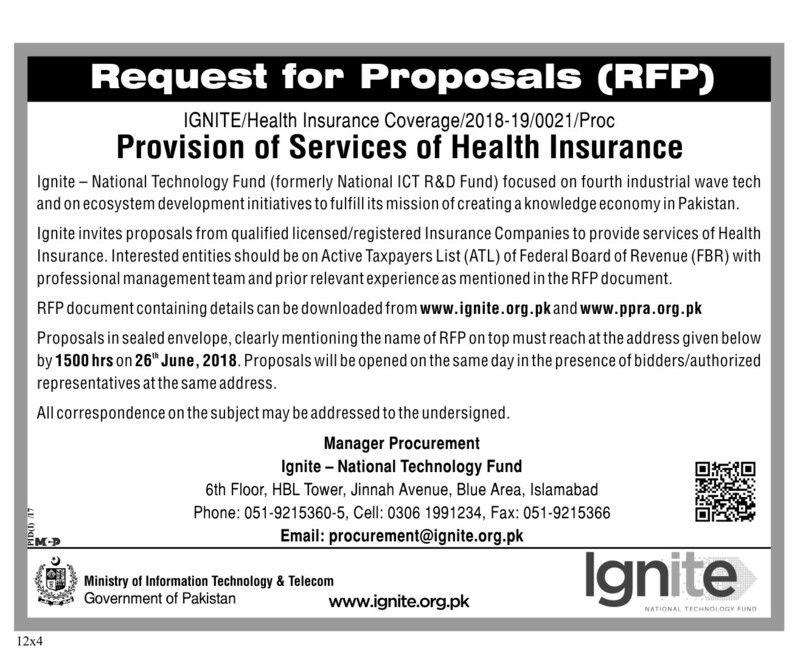 Ignite invites proposals from qualified licensed/registered Insurance Companies to provide services of Health Insurance. Interested entities should be on Active Taxpayers List (ATL) of Federal Board of Revenue (FBR) with professional management team and prior relevant experience as mentioned in the RFP document. Proposals in sealed envelope, clearly mentioning the name of RFP on top must reach at the address given below by 1500 hrs on 26th June, 2018. Proposals will be opened on the same day in the presence of bidders/authorized representatives at the same address. Submission Deadline: Deadline for proposal submission is Tuesday, June 26, 2018. 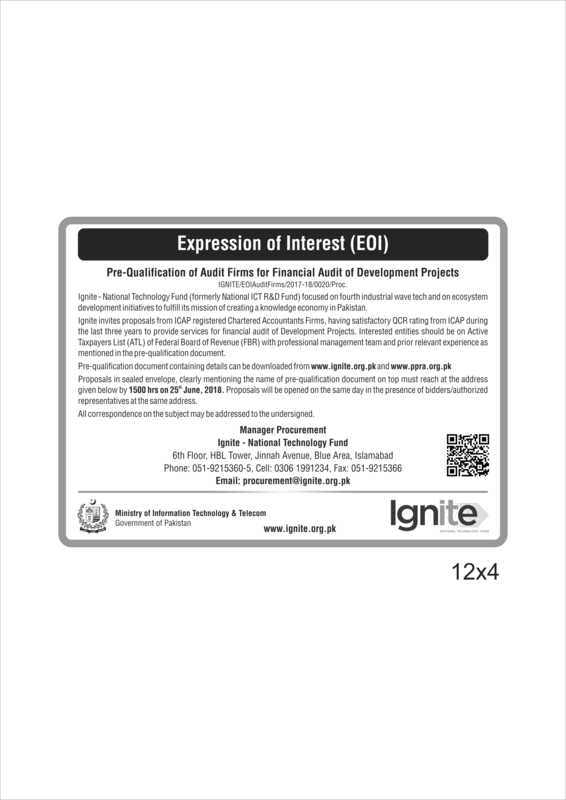 Ignite invites proposals from ICAP registered Chartered Accountants Firms, having satisfactory QCR rating from ICAP during the last three years to provide services for financial audit of Development Projects. Interested entities should be on Active Taxpayers List (ATL) of Federal Board of Revenue (FBR) with professional management team and prior relevant experience as mentioned in the pre-qualification document. Proposals in sealed envelope, clearly mentioning the name of pre-qualification document on top must reach at the address given below by 1500 hrs on 25th June, 2018. Proposals will be opened on the same day in the presence of bidders/authorized representatives at the same address. Submission Deadline: Deadline for proposal submission is Monday, June 25, 2018. 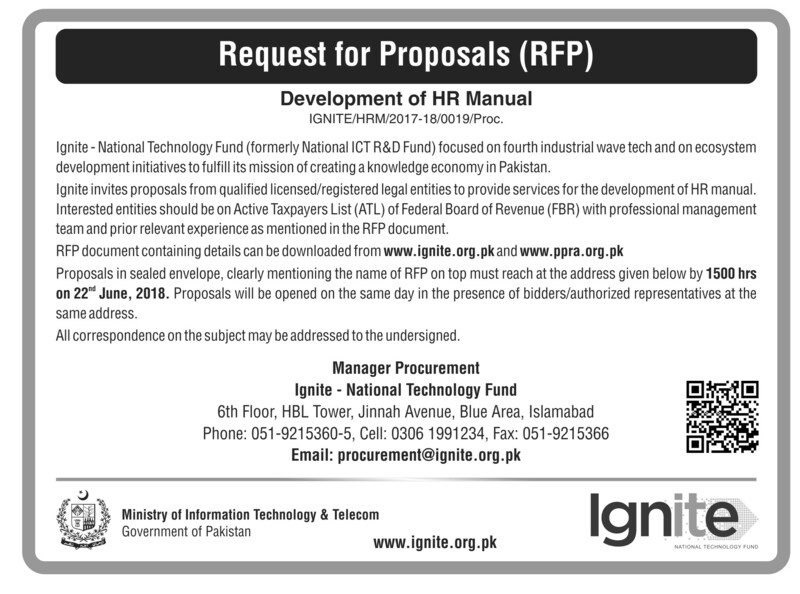 Ignite invites proposals from qualified licensed/registered legal entities to provide services for the development of HR manual. Interested entities should be on Active Taxpayers List (ATL) of Federal Board of Revenue (FBR) with professional management team and prior relevant experience as mentioned in the RFP document. Proposals in sealed envelope, clearly mentioning the name of RFP on top must reach at the address given below by 1500 hrs on 22 June, 2018. Proposals will be opened on the same day in the presence of bidders/authorized representatives at the same address. Submission Deadline: Deadline for proposal submission is Friday, June 22, 2018.